Various secondary sources such as company websites, encyclopedias, directories, and databases such as Composite World, Factiva, and American Composites Manufacturers Association, and so on have been used to understand and gain insights into the composite coatings market. 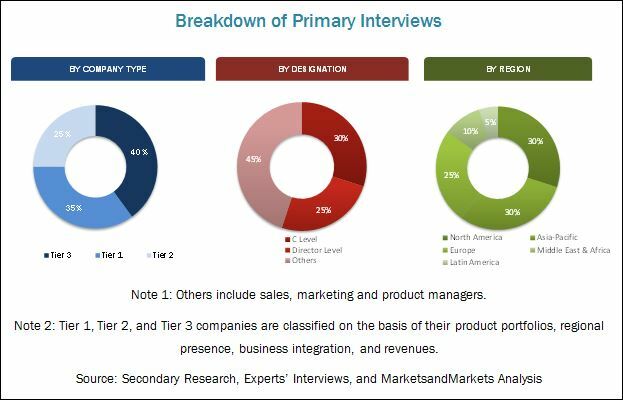 Experts from top composite coatings companies have been interviewed to verify and collect critical information and to assess the trends in the composite coatings market for the forecast period. The top-down, bottom-up, and data triangulation approaches have been implemented to calculate the exact values of the overall parent and individual market sizes. The composite coatings market has a diversified ecosystem, including downstream stakeholders such as manufacturers, vendors, end-use industries, and government organizations. The composite coatings value chain includes resin manufacturers such as Arkema (France), Mitsubishi Plastics, Inc. (Japan), Huntsman Corporation (U.S), and others. Further, the manufacturers of composite coatings supply their products to various entities for aerospace & defense, transportation, industrial, and oil & gas, among other applications. This research report categorizes the composite coatings market based on product type, application, and region. It forecasts revenue growth and analyzes trends in each of the submarkets till 2021. The global composite coatings market is projected to reach USD 1,306.8 Million by 2022, at a CAGR of 7.7%, from 2017 to 2022. 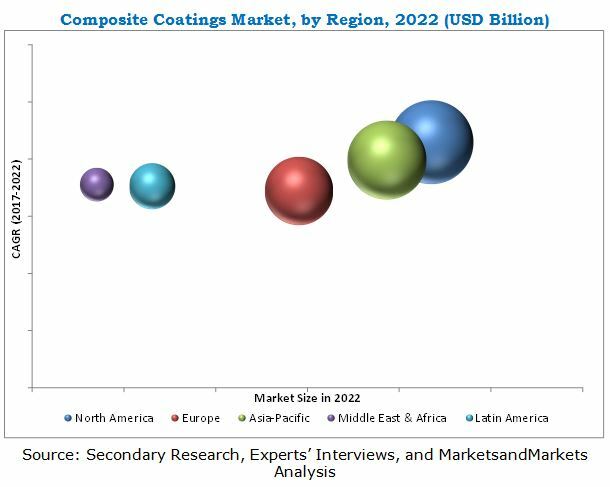 Increasing demand for composite coatings for anti-corrosion and self-lubrication in the transportation industry and anti-corrosion and chemical resistance in the oil & gas industry are the key factors leading to the growth of the composite coatings market. The composite coatings market, by application, is further segmented into anti-corrosion, UV protection, thermal protection, and others. Composite coatings for the anti-corrosion application comprise a major market share due to their properties such as uniform coating thickness, accuracy, and consistency, and so on. Due to these features, they are utilized in large volumes in industries such as transportation, industrial, and oil & gas. The major end-use industries in the composite coatings market include transportation, aerospace & defense, oil & gas, industrial, and others. The transportation end-use industry is the fastest-growing segment in the composite coatings market. Composite coatings offer various features including uniform coating thickness, accuracy, stiffness, and consistency in comparison to powder coatings, due to which these are utilized in the transportation, oil & gas, and industrial end-use industries. North America is expected to be the fastest-growing market for composite coatings during the next five years. The main factors that are leading to its growth are, the increasing demand from the transportation and aerospace & defense industries. These advanced coatings are utilized for the different equipment used in these industries as these provide uniform coating thickness, accuracy, stiffness, and consistency, leading to the low maintenance cost required. The global composite coatings market is rapidly growing, in terms of value. However, a few factors act as restraints in its growth in the global composite coatings market. The high production cost is a major restraint in the growth of the global composite coatings market. Companies such as PPG Industries, Inc. (U.S.), Axalta (U.S.), Mader Group (France), A.W. Chesterton Company (U.S.), K C Jones Plating Company (U.S.), Om Sangyo Co. Ltd. (Japan), Endura Coatings (U.S.), Twin City Plating (U.S.), Aztron Technologies LLC (U.S.), Nickel Composite Coating Inc. (U.S.), Surteckariya Co. Ltd. (Japan) and others are the leading market players in the global composite coatings market. They have been adopting various organic and inorganic growth strategies such as agreements, acquisitions, and expansions to enhance their shares in the global composite coatings market. 12.6 OM Sangyo Co., Ltd.
12.11 Nickel Composite Coatings, Inc.
12.13.8 Advanced Surface Technologies, Inc.
12.13.9 Laser Applied Surface Engineering Ltd.